Ideal conditions greeted the first wave of riders to leave Kei Mouth for the start of the eighteenth Imana Wild Ride on Sunday 23rd July. 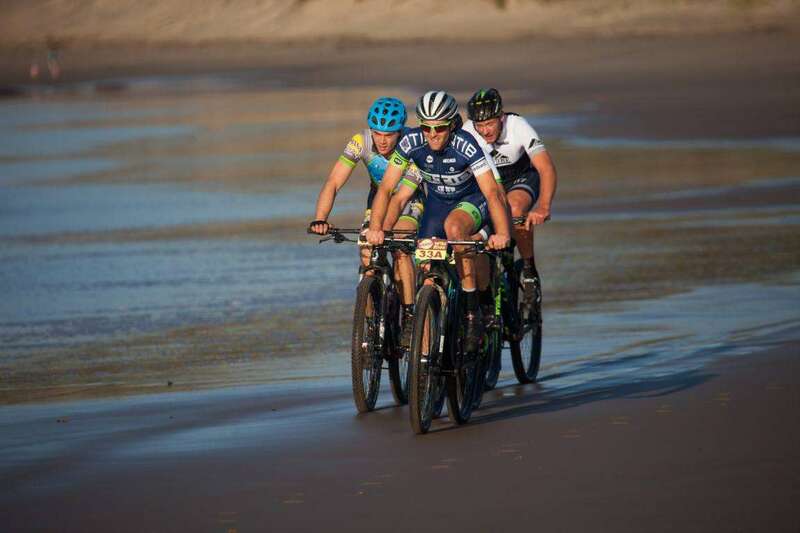 From the start it was clear as to who was there to race and who was there to relish the spoils of cycling along the wild coast – the latter applying to the large majority of the field. It soon became apparent that the racing would be down to two teams as five times defending champion Warren Price and the experienced Andrew Hill (Team Safire/TIB) stretched the lead along the pristine beaches and grassy hills. Their only threat came from Damon Stamp and Darren Lill (Wild Ride Supa Soyas) who did not let the leaders stray far from their sights. Some tactical racing ensued but on arrival at the first overnight at Kob Inn, it was Price and Hill first across the line in a time of one hour, fifty-seven minutes and 20sec. Stamp and Lill followed less than two minutes back having taken a little tumble along the way and been led astray up a bogus sneak ! The mixed category was hotly contested with veteran couple Craig & Christine Woods pulling out all the stops to outsmart the youngsters; Bianca Haw and Andrew Houston. However, it was Haw and Houston who took the lead, arriving at Kob Inn in an impressive time of two hours, twenty-seven minutes and 11sec – just over a minute clear of the Woods’. The wild coast certainly dished up the spoils with reports of whale sightings and a rare aerial view of a Great White seen by the helicopter pilot. It would perhaps be less comforting for the participants to hear of this as they face crossing the Mbashe River tomorrow – a well know Zambezi shark breeding ground. The second wave, named ‘Ride the Wave’ follows a day behind with a further one hundred participants making their way up the coast. Participants in the first event; ‘Race the Tide’ will face a short and fast second day from Kob Inn to The Haven over a distance of about thirty-two kilometres which should see the leaders home in well under two hours whilst the slower teams will take up to four hours to complete the stage. RESULTS: Overall – 1. Warren Price & Andrew Hill (Safire / TIB) 1h57.20, 2. Damon Stamp & Darren Lill (Wild Ride Supa Soyas) 1h59.11, 3. Bianca Haw & Andrew Houston (Beauty & the Skinny Beast) 2h27.23 – 1st Mixed, 4. Craig & Christine Woods (Wildefire) 2h28.35 – 2nd Mixed, 5. David Yapp & Keith Wenke (Beer & Wine) 3h01.12.